Back-office efficiency and smart use of technology lie behind the results that Controlaccount Plc delivers in both straightforward debt recovery and the broader range of credit management services we offer. Our continuous approach to invest in modern technology enhances our customer experience, drives performance and delivers cost effective recovery solutions. Take a look at Client Web to appreciate our secure, bespoke, on-line portal for clients. You can also take advantage of our own, unique software case management system - which delivers competitive edge from being the only commercially available software to truly support the complete recovery process with fully integrated collection and litigation case management facilities. Our internal software CogendaWorks is the product of over 20 years of development; a new generation of intelligent debt collection and litigation software packed with cutting edge features that enable us to provide a market leading service. 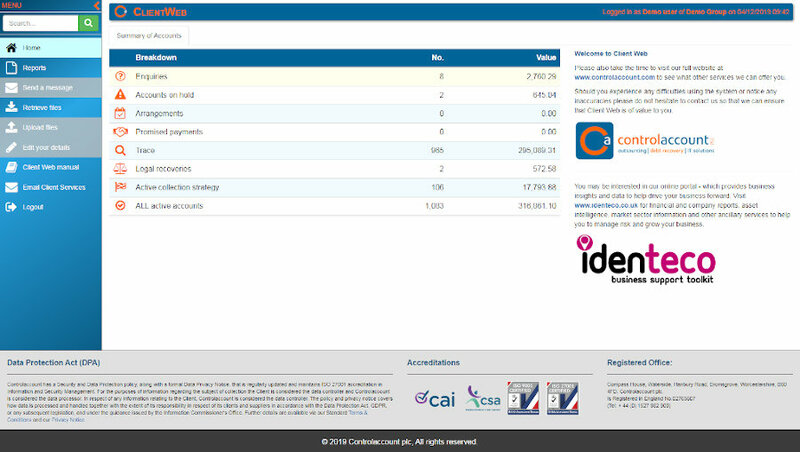 CogendaWorks is a brand wholly owned by Controlaccount Plc.